Martin Roll was interviewed on The CMO Show on 14 December 2017. Hosted by The Filtered Media, Australia’s leading integrated media agency focusing on brand storytelling and the future of marketing, the CMO Show features global thought leaders about emerging trends in content marketing, SEO, social media, public relations and digital disruption. During the interview, Martin Roll spoke about building brands and businesses in Asia, key challenges faced by CMOs, Artificial Intelligence, K-Pop, WeChat payments, e-commerce, retail strategy and other trending business topics that will impact the marketing world in 2018. In China, the much hyped Singles Day on 11 November 2017 again smashed e-commerce sales records. E-commerce platform Alibaba alone generated more than USD 33 billion in revenue in 24 hours. Clearly, an increase in consumer spending and consumer confidence, together with rapidly emerging new consumer classes, are the new defining features of China and Asia. Today, Asian products are no longer associated with low-cost and considered inferior to Western products and brands. In the past 10 years, Asian firms have realized that they need to move up the value curve and one way to do that is to build their own brands and even premium brands. To do this, Asian brands have to truly differentiate themselves from the other brands in the global marketplace, which is not always an easy task. There are a handful of Asian brands which have managed to gain sophistication and succeeded in competing effectively on the global level. One successful example that Martin Roll described is Singapore Airlines – an Asian brand which is the embodiment of a well-delivered brand promise with strong Asian roots. The Singapore Girl was created in 1973 based on the promise of a great way to fly based on delivering consistent great service and by using the latest technology available. However, just having a brand promise alone is not enough to achieve strong equity. The promise needs to be backed by a strong delivery system throughout the entire organization. Martin Roll cautioned that branding is not just simply about storytelling, but also about effective leadership, management, touch points and customer journeys – to name a few important elements that need to work closely together. 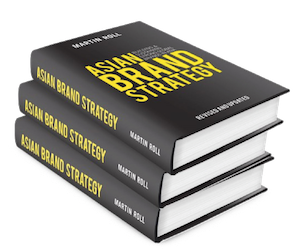 For businesses to effectively build strong brands in modern Asia, branding needs to be an organizational top-down exercise where branding is sponsored and led by the top, instead of just being delegated to the marketing function. In fact, Martin Roll believes that Asian brands take customer experience seriously and are actually a little more novel when it comes to building brands. Another example of a successful Asian brand is Samsung. Just 10 to 15 years ago, Samsung was a very different company. Today it is a global behemoth competing head-on with Western brand Apple based on its quality features and cutting edge technology. Another non-premium example is AirAsia in which it promises a non-premium experience at a low cost. Taking a closer look at the customer experience, many elements are actually the same in terms of pre-flight experience, food, welcoming and hospitality. Since its founding in 1993, AirAsia’s low-cost branding has clearly stood the test of time. To truly differentiate themselves, Asian brands need to be very clear in defining what they stand for in the market, who they target, and ensure that this brand position is consistently communicated through all touch points. In the media, it is often common to come across references to Asia as a homogenous region. In reality, Asia is not a homogenous entity but a complete melting pot of cultures and identities. In recent years, Asian countries are becoming more and more traversed by cultural flows permeating the region: cinema, music and fashion trends that are present extend beyond national borders to capture the imagination of millions. Branding and brands do not operate in vacuum, but are closely linked to developments in society, to people and to cultures. Martin Roll observes that in the last 30 to 40 years, anything that came out from the Western world was considered popular – German cars, French cosmetics, Hollywood dreams. However, in recent years, Asian firms have realized their own local potential and have started to capitalize on that. One success story is the huge rise of the Korean Wave (Hallyu in Korean). The Korean media and entertainment industry has managed to create a unique image of cool through its entertainment products including movies, TV dramas, music bands and more. Other successful Asian pop culture icons are Bollywood and Chinese pop-stars. With so much potential for differentiation and branding in Asia, it is imperative for Asian organizations to start paying more attention to their unique cultural assets. In terms of consumer outreach platforms, Martin Roll believes that every country in Asia is unique. In China, WeChat is not just a conversational platform but also used for eCommerce and business. Baidu is a search powerhouse in China that cannot be ignored given its massive revenue and business growth in the last 10 years. In the Philippines, locals are using SMS for services such as banking and micro-finance. Digital has indeed changed the traditional relationship between companies and consumers. This digital phenomenon whereby the middle class has never grown up with traditional media but are instead digital natives is something that brands need to learn to maneuver and consider when developing their strategies. Looking towards the future, Martin Roll believes that there will be a rise of omni-channel between online and offline. E-commerce is popular today, but it is a very isolated and transactional experience. Human psychology works in a way where humans want to be part of social constructs and tribes. Moving ahead, Martin Roll believes that consumers will want to re-engage in a physical environment. As such, brands will need to find a seamless balance between retail and online. Global fast fashion brand Zara has done very well in this aspect, where it started with brick-and-mortar and also created a strong e-commerce franchise in recent years. Nonetheless, Martin Roll admits that it is difficult to achieve this balance in reality. Today’s consumers are getting bombarded with information and as a result become more fickle with their decision making. In addition, consumers have higher expectations than ever before. Brands need to adjust to this modern world of consumers. Looking ahead to 2018, Martin Roll believes that there will be more disruption to be expected within Asia. Companies and consumers alike need to embrace new technology. Artificial Intelligence (AI) will be the next buzzword and will start to change the way businesses operate through automation. There is so much potential for brands to leverage technology as an enabler to better enhance customer experience and it will certainly be intriguing to see how brands will do this in the coming years.